NABPAC and the NAB Government Relations team have had a busy start to the year, meeting and educating members of the 115th Congress. Thanks to the early support of over 200 donors, we are keeping up with the demand, but there is power in numbers. Participate in NAB's State Leadership Conference, or visit Congress anytime you're in D.C. Members want to hear from their constituents. NAB can help you coordinate meetings. Sign Prior Approval so you can receive information on our efforts. Donate today! Contributions to NABPAC support pro-broadcast members who oversee our industry. Read on to learn more about upcoming events, Ajit Pai’s first 100 days in office and why NABPAC donor and Trustee Marci Burdick chose to get involved. We are looking forward to a productive 2017 and an even stronger NABPAC. With your help, we can accomplish both. Many of you received a hard copy of our 2016 annual report. It details the work we do and highlights the success we're afforded because of your participation. Please be sure to check out the digital version here. To request copies, please email me directly. Transparency and regulatory efficiency appear to be the golden rules thus far in the Federal Communications Commission under new Chairman Ajit Pai. After being appointed by President Trump in January, Chairman Pai wasted no time getting to work to advance these goals. At Chairman Pai's first meeting as head of the agency, the Commission unanimously voted to eliminate the requirement for commercial broadcasters to maintain a paper file with letters and emails from the public as part of their public inspection file. Following the meeting, Chairman Pai announced two initiatives of particular note. Going forward, consent decrees will require a vote of the full Commission. Chairman Pai also announced a pilot program to test the public release of draft Commission documents in advance of Commission votes in order to enhance transparency and to facilitate greater public discourse and input. The FCC released draft documents in two pro-broadcaster proceedings: a draft notice of proposed rulemaking for the ATSC 3.0 "Next Generation" broadcast standard and a draft AM revitalization report and order. At the Commission's February meeting, commissioners unanimously approved both items. Looking ahead, we expect the Chairman to work with broadcasters to streamline burdensome regulations and continue a push toward enhanced transparency. NABPAC will update you as we learn more. "Prior Approval" sounds scary, but it's really just the Federal Election Commission's fancy way of saying, "Please sign this permission slip." Every trade association is legally required to ask their corporate members for prior approval before their employees can learn about the association's PAC. Help us expand our reach and learn more today! NABPAC and broadcasters around the country will be hosting in-state fundraisers for these members through March. Please consider lending your support to our efforts by clicking on their names below. How long have you been a broadcaster? 45 years. I have been continuously employed in the media (either part or full time) since getting a job in radio at age 14. I started in TV at age 18 and, while our company (Schurz Communications) exited the broadcast business in 2016, I am still working on industry projects. What incentivized you to give to the PAC? I came to understand the pressure on lawmakers to raise money in a meeting with a congressman who was always friendly to broadcast interests. In discussing a "broadcast vs. cable" issue, he turned to an aide and asked directly if broadcasters were supporting him. What are you hoping to get out of the PAC as a member? I want to help ensure broadcasters have a "seat at the table" to tell our great stories AND to help influence positive outcomes when lawmakers are considering our issues. As an individual, I can't do that by myself. 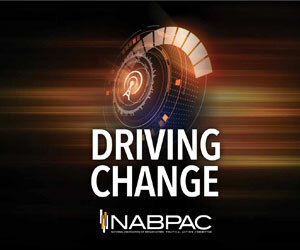 Being a member of NABPAC helps me and our industry speak with a louder voice. Tell us a fun fact about you! I've climbed Mt. Rushmore (legally) twice!